This title offers an inside look at the history, terms, and key players of this world religion. In more than 700 A-to-Z entries, “”Encyclopedia of Islam”” provides easy access to the terms, concepts, personalities, historical events, and institutions that helped shape the history of this religion and the way it is practiced today. 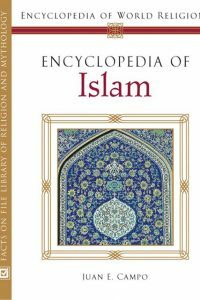 An informative introduction provides readers with an overview of Islam, and a chronology, a detailed bibliography, an index, and 89 black-and-white photographs complete this timely resource. Entries include on: Abbasid Caliphate; Abraham; Akbar; Almsgiving; Anti-Semitism; Arab League; Arabian Nights; Yasir Arafat; Archaeology; Ayatollah; Bahai faith; Bosnia and Herzegovena; Christianity and Islam; Cinema; Dhimmi; Evil eye; Hajj; Hamas; Ibn Battuta; Islam and politics; Malcolm X; Ottoman Dynasty; Salman Rushdie; Slavery; Usama bin Ladin; Women; and, Zamzam.